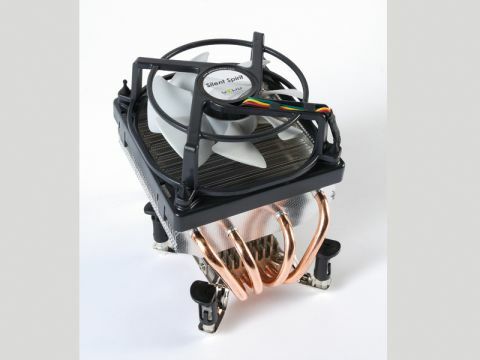 Can this little upstart beat the classic Freezer 7 Pro in the value CPU cooler stakes? For a long time now, Arctic Cooling's Freezer 7 Pro has been the standout choice in terms of budget performance air cooling for your CPU. Indeed it's bested many of the closed-loop, watercooled options in our tests. Given it costs a shade over £20, that's nothing to sniff at. Now, seemingly out of nowhere, comes Gelid with its Silent Spirit cooler, aiming to take the crown away from the Freezer 7. And it's a damned close run thing. There's so little to choose between these two coolers, both in terms of performance and in terms of price. Running my slightly overclocked E6550 at full load the Spirit managed to stand firm at 52°C, three degrees lower than the more expensive, water-cooled option I've been using. Impressive figures, but then the Freezer 7 Pro garnered exactly the same performance numbers. With parity across the price and performance spectrum, there's nothing to choose between them. Unfortunately for the Spirit, it all comes down to design. The upright nature of the Freezer 7, and it's easily removable fan, makes installation and removal a doddle, even in a fairly packed case. The Silent Spirit is not so forgiving, though. The twisty Intel clips are buried under the heatsink, meaning that there's a good chance of leaving some flesh behind when you come to try and get it out of your case. In simplicity of design then, if nothing else, the Freezer 7 Pro still rules the roost.